I really love the colours in the picture and tried to match them. I’ve used Blushing Bride and Coastal Cabana. 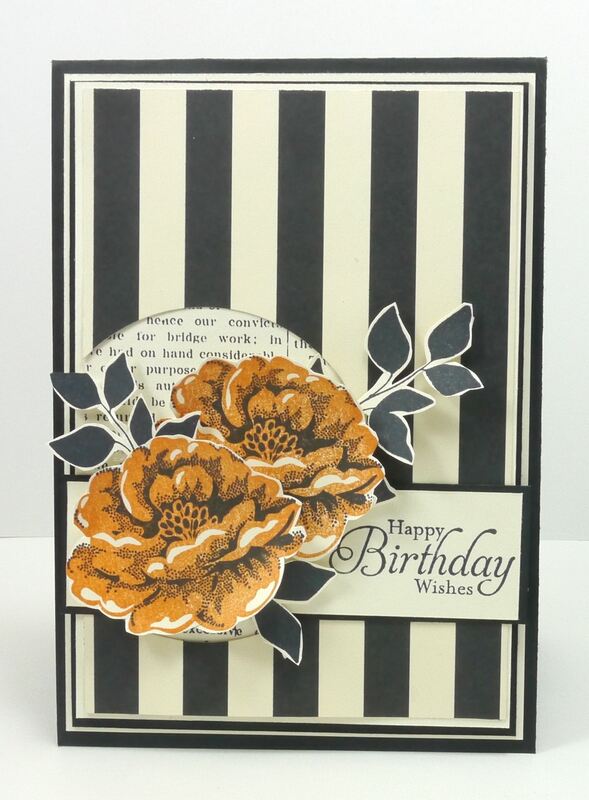 To achieve my striped tag I inked the inside of my striped embossing folder and ran it through the big shot. I finger walked Dictionary in Blushing Bride over the background and inked up the flowers from Stippled Blossoms. To finish off my card I used a sentiment from Petite Pairs. Come and join us with this challenge. 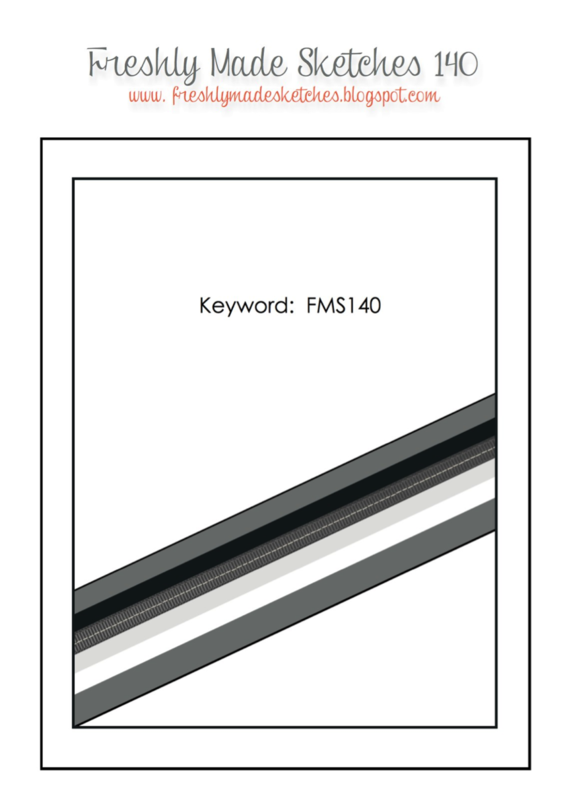 Head over to The Card Concept and check out the gorgeous inspiration from the Design Team. It’s time for a new sketch at Freshly Made Sketches. This week the lovely Cindy Hall is our sketch hostess and she’s provided this fabulous sketch. I had so much fun creating my card and I know you’re going to love her sketch too! Strawberry Slush is a colour I don’t use much, so I decided it was time to bring it out of the back of the cupboard and give it a go. I really love the drama of any colour with Basic Black so that’s the colour I’ve teamed Strawberry Slush with today. 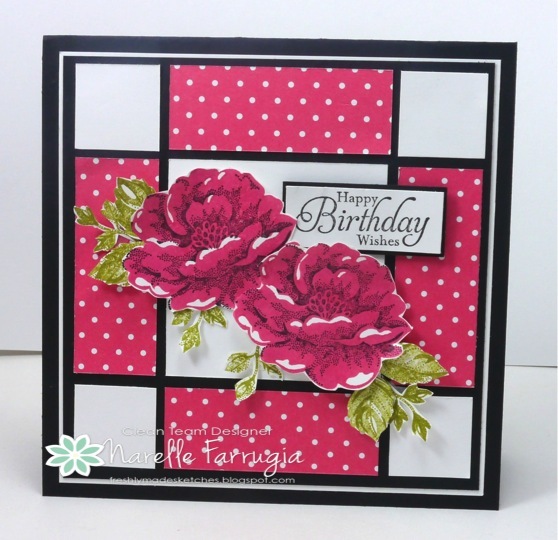 I’ve gone with one of my favourite flower stamp sets – Stippled Blossoms – for my card. My leaves are also from this stamp set and are stamped in Old Olive. I’m so lucky I made my cards for this weeks design team committments on Sunday. I wouldn’t have got them made if I left them until Monday. The reason for this is because I had a fall on Monday and fractured my left radial head (a bone in my elbow) and I’m left handed! I’m sad to say I’m going to be out of action after tomorrows post for a little while – can you imagine how completely devastated about this? This post has taken forever to type with my non-dominant hand. 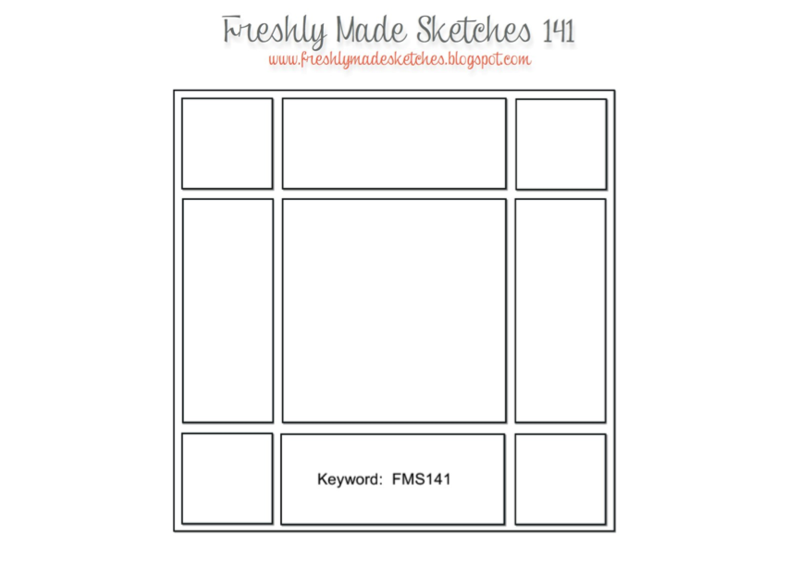 We’d love it if you can join us this week at Freshly Made Sketches. Head over to the challenge and have a look at the gorgeous inspiration from the design team. Linda Callahan is this weeks hostess at Freshly Made Sketches. 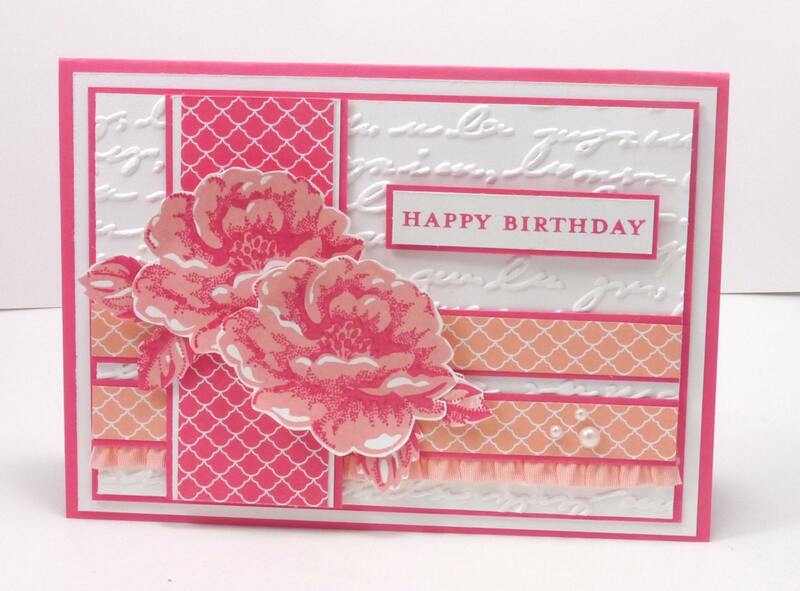 I just love Linda’s creative sketches and always love how easy my cards come together using them. 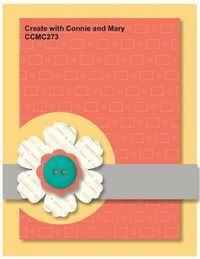 I can’t wait to see what you create with Linda’s sketch – head over to Freshly Made Sketches and link up a card. While you’re there, check out the fabulous inspiration from the Clean Team. Another Wednesday, means a new challenge at Freshly Made Sketches. This week my sweet stamping friend from across the ditch, Karren Johnson, is our hostess with her first ever sketch for Freshly Made Sketches. Karren has created an amazing sketch that I know you’re going to love. 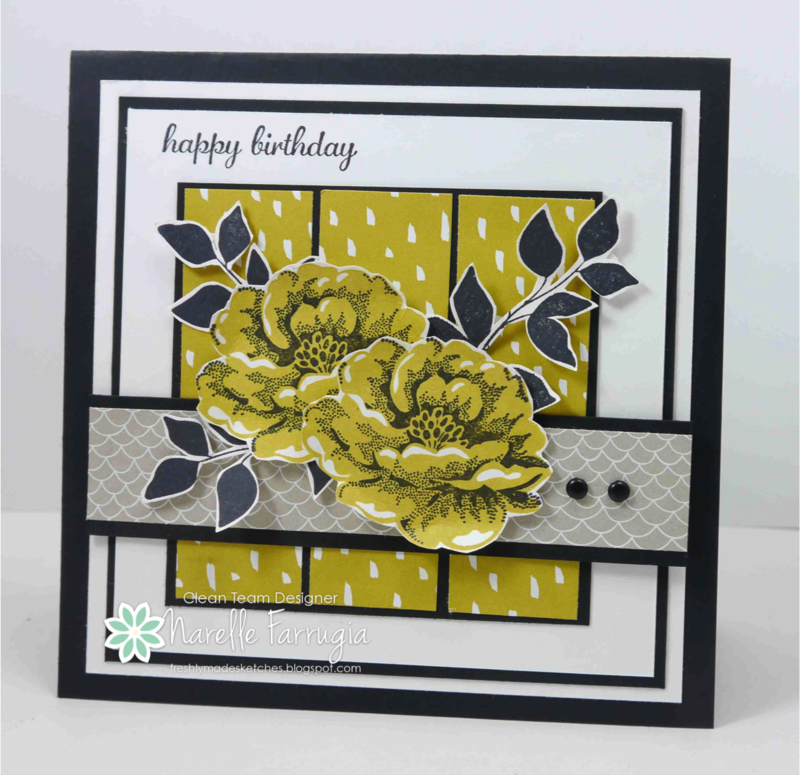 I tried a new-to-me colour combo (Basic Black, Summer Starfruit & Sahara Sand) courtesy of Stampin’ Up!s Sale-a-Bration DSP called Sweet Sorbet. 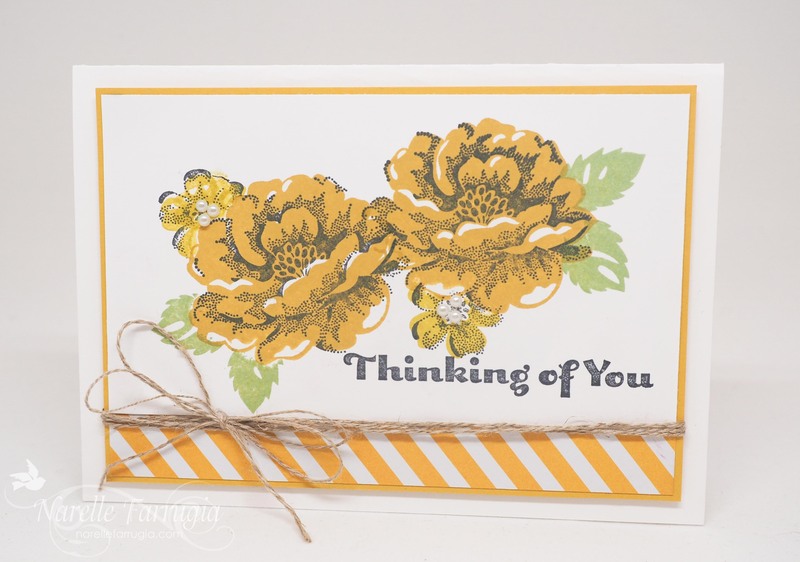 The flowers are from a Stampin’ Up stamp set called Stippled Blossoms and the leaves are from Summer Silhouettes. The sentiment is from a set called Express Yourself. 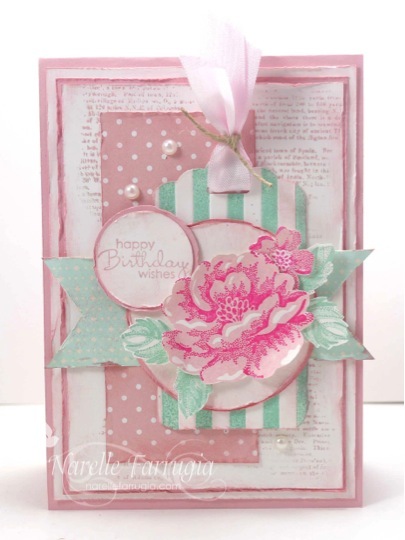 Come and join in with Karren’s sketch challenge at Freshly Made Sketches. While you’re over at the challenge, check out the gorgeous inspiration from the Clean Team. I’m back with another post. 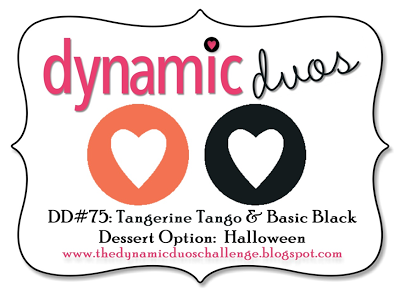 This time I’ve combined my card for two challenges – Dynamic Duos where their challenge is to create a card using Tangerine Tango and Basic Black with the option of Halloween. 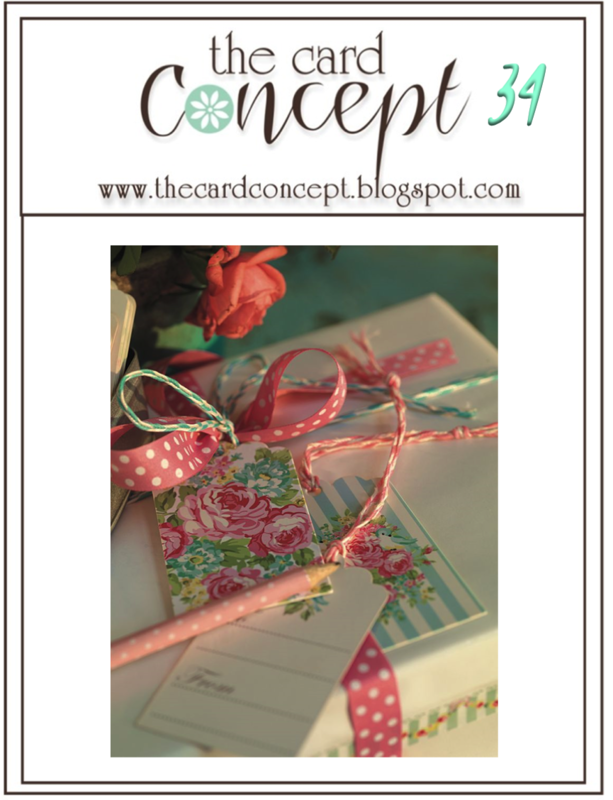 I’ve used this gorgeous sketch from Create with Connie & Mary for the layout of my card. I chose not to go with the option of Halloween (as I think I Halloweened myself out with my earlier projects – you can find them here) but I have used some retired Stampin’ Up! Halloween DSP called Howlstooth & Scaringbone DSP. I really love this striking striped DSP and am almost at the end of it which is a bit sad.